You may access and read most material on MRA's Web site without giving us any information that identifies you. However, when you engage in certain activities on this Web site, we may ask you to provide certain information about yourself by filling out and submitting an online form. It is completely optional for you to fill out the form and/or engage in these activities. MRA provides "offline" paper/print-based options as well. MRA collects all of this information in order to record and support MRA registration and other sailing related activities. For example, we may use the information to pre-fill registration forms from season to season, support and maintain scoring processes, send you MRA-related communications, etc. If you have identified yourself, you may receive communications from MRA. MRA may share the information that you provide with US Sailing and Mass Bay Sailing, should you choose to register with either or both of those associations through our registration form. Please note that we use a credit card processing company to bill you for services. These companies do not retain, share, store or use the personally identifiable information that they receive from MRA for any other purposes. We reserve the right to disclose your personally identifiable information as required by law and when we believe that disclosure is necessary to protect our rights and/or to comply with a judicial proceeding, court order or legal process. MRA recognizes and appreciates the importance of the responsible use of your personal information. Except as disclosed above, we do not release or sell lists of our customer names to outside organizations. Further, your personal information is password-protected to prevent unauthorized access to it. Please be advised that MRA is not responsible for the content or privacy practices of any other Web sites to which MRA may link. When you accept our cookies, we use them to track your visit to www.mheadrace.org. In addition, we use log files to help manage our Web site and other electronic communications. However, none of this information, identifies you personally or is tied to any of your personally identifiable information. You remain anonymous. As with most Web sites, MRA also gathers certain information automatically and stores it in log files. This information includes Internet protocol (IP) addresses, browser type, Internet service provider (ISP), referring/exit pages, operating system, a date/time stamp and clickstream data. We use this information, which does not include personally identifiable information, to analyze trends, administer the site track users' movements around the site and gather demographic information about our user base as a whole. You have the right to correct your personal information. This may be accomplished either directly on our Web site on those screens that allow you to edit your personal information; by writing to MRA at: Marblehead Racing Association - P. O. 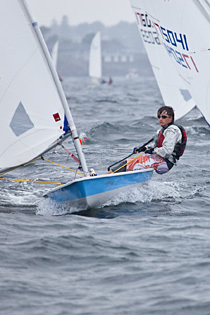 Box 382 - Marblehead, MA 01945-0382, USA; or by e-mailing us at webmaster@mheadrace.org. When you contact us please include your name, address and/or e-mail address, and a detailed explanation of your request. MRA follows industry standard safe unsubscribe practices. You have the right to opt out of receiving communications from MRA by using the opt out functionality found on our web site; by writing to MRA at: Marblehead Racing Association - P. O. Box 382 - Marblehead, MA 01945-0382, USA; or by e-mailing us at webmaster@mheadrace.org. When you contact us please include your name, address and/or e-mail address, and a detailed explanation of your request. The security of your personal information is important to us. Your personal information, as well as your credit card information, are encrypted during transmission using secure socket layer (SSL) technology, which is widely used on the Internet for this purpose. MRA adheres to generally accepted industry standards to protect this information, both during transmission and once we receive it. These standards include the use of leading hardware and software applications. However, no method of transmission over the Internet or method of electronic storage is 100% secure. Therefore, while we strive to use commercially acceptable means to protect your applicable information, we cannot guarantee its absolute security. If you have any questions about security on our Web site, you can e-mail us at webmaster@mheadrace.org.